Something about fall brings me into the kitchen, and I know I am not the only one. Fall is baking-bread time. 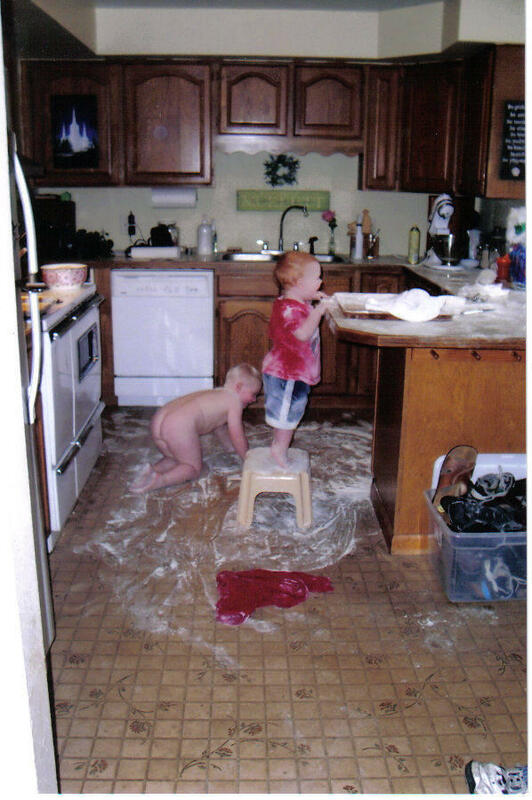 I do not really let them do this every time I bake. Sometimes it is a no-nonsense affair, and they have to go find something else to do, but sometimes, if I am feeling like a happy mom, I let them have a ball helping me. As they grow up, I hope these are some of the good memories they have of a warm kitchen, a cheerful mom, and hearty, healthy, good smelling and yummy homemade food. Last week I sent both kids out in the backyard to pick the small, hard apples off of our four apple trees. When they were done throwing them at each other and across the yard, they came in with about 1/2 a basket of actual usable apples. But, we are going to make a small batch of applesauce, and I know it will be the best applesauce ever; it came from our trees, gathered by my children… How could it not be? unequivocally, I hate being pregnant. Not just me, but my body hates being pregnant. Oh, I know children are a gift, and I treasure my children, I really do, even this little unborn one. But, loving my children and being pregnant… so not the same thing! I have come to conclusion that I can hate being pregnant, and I can still totally love my kids. When I was a girl, I was riding my bike down our street one day, and I saw a squished frog. It looked like a car had run him over, and all his guts had come out his mouth. I have never forgotten what he looked like, and I often thought about how awful that would be. That is pretty much how I feel when I kneel yet again over the kitchen sink, the garbage can, the toilet, the bathtub, a plastic bag, or out the car door… I feel as though my guts are being squished out my mouth. Uggh. By the way, there is little more humiliating that sitting at a traffic light, and having to open the car door and barf out onto the pavement. Why didn’t I have a plastic bag, you think? Well, when I have already used the plastic bag in my purse, what are my options? Yesterday my computer took a swan-dive into the lake of discontent. To say that it s..l..o..w..e..d down is the understatement of the year, and my computer skills being what they are, I was helpless. I have been known to fix computers by taking off (usually) my shoe and beating the computer with it; since this machine is less than a year old, I used restraint and had DFM call a friend to come take a look at it. Even making that call was progress for me…and an exercise in self-control. So after several hours of twiddling and waiting for the computer to stop talking to itself like Rainman, things are better. Not perfect yet, but at least the thing doesn’t have a virus or something equally devastating. While the friend worked on my computer, he kept attempting to explain what he was doing, which is like talking Swahili to an Eskimo. Actually, I have to leave the room while computer talk is going on- it makes me feel like I can’t breathe and the walls are closing in… How’s that for un-tech? It’s really simple, actually. To me, computers are magic; they do or don’t do what you want depending on something like the computer fairies, and some (odd) people have the ability to charm the fairies and make them do what they want them to do. It seems like playing D & D or having a scraggly beard gives you an advantage over the fairies, but I am only guessing. A short while ago, I had a birthday party for a boy who just moved into our ward from Texas. The family didn’t know anyone yet, and the kid and Jeffrey really play well together, so I invited them over, and said I would throw a small party. The mom is really cool, and we get along too, so it was really no hardship. The kids and I blew up some balloons and bought a cake at the grocery store, called Dominoes for a couple of pizza’s to be delivered and called it good. When the family got here, they were happy and grateful to see what we had done, and the kids began to play and get loud. There were only five kids here, plus the mom and her very cool teenage daughter, but if you were listening from outside, you would have sworn there was an entire kindergarten downstairs. It was loud, but so what? Isn’t that what kids parties are supposed to be like? The mom and her daughter wanted to see my design work, which is downstairs in my office and studio (our extra bedroom, really), so we were all in the basement. The kids were tearing up and down the stairs, laughing a romping and having a ball, while we talked textiles. Then the boys both rushed in the office, yelling that the pizza-guy was here… I had forgotten that I called, and rushed upstairs to get the door. As I got upstairs, I could see that the pizza-guy was already in the living room, holding his pizza’s and looking extremely annoyed. Still not realizing that anything was wrong, other than the pizza-guy in my living room (have to re-stress to kids not to open the door), I grabbed my wallet and asked him what I owed him. It was then he layed into me. Ever had a pizza-guy criticize your parenting? Ever had him do so in front of guests and your children? Yes, folks, the Pizza-Guy began to tell me how long he had been standing there, in my living room, waiting for me. He began to tell me how loud and crazy the kids were, and how long he had been hollering for an adult at the door. He told me how dangerous it was that the kids had let him in, where was I while all this was happening? Huh? He told me how much time I had cost him on his route, and how I really needed to have a better handle on my family, or someone could get hurt… (I am not kidding! And he was still holding our pizza) My friend, her daughter, and all our kids are standing there looking at him with slack jaws, and I just stood there, eyes wide, like a deer in the headlights. For the first time ever, I was dumbstruck. I could not believe what I was hearing, and thus could not even fathom what to say to the guy. I never said a word. Just handed him his money, opened the door, and shut it on him. As soon as I closed the door, my friend and her daughter exploded. I turned around, still kind of dumb, and asked if that just actually happened? We had a good laugh about it and imagined all of the things I could have said (and usually would have). I still don’t know where my tongue was that day… But it is probably a good thing that I went inexplicabley mute. My children can go all there lives without hearing what I wanted to say, and my friendship is probably better with this mom, too. About ten minutes later, as the kids were chowing down on their cool pizza, the phone rings. Yes, it is him. Pizza-Guy is calling to say he is… Sorry. He says he realized he acted harshly, and that he had no right to speak to me that way. Ok, dude. I guess it’s good that his conscious got to him, but I wonder what really happened? I think he was afraid I might call Dominoe’s and cost him his job. Nah, not today. Its good enough that he figured out he was a tool on his own. I bet his mama would be proud! Last night, at 11:30, just as the news was ending and Letterman was starting, I had to run to the bathroom after trying to clean up the kitchen… The smell of the dinner dishes in the sink was just too much for my hideously pregnant body. DFM was already in bed asleep, (he gets up really early for work, and I am a natural night owl) but when he heard me yacking in the other room, he got up to check on me. (Asking a pregnant woman what you can do for her as she barfs, and you are the one that knocked her up, is a bad idea, but we won’t get into that.) Then, he went in the kitchen and cleaned the whole thing. Did the dishes, wiped everything down, even sprayed peppermint oil soap in the sink to mask the drain-smell. Even though he had to be up at 5:30, he did that for me. Then, he covered me up on the couch, and went back to bed. Is that love, or what?? I love him! It seems Mr. Fish and his recent relocation has sparked a bit of a family feud. Last night after Dumber #26 read my post about what Mom did, he called her at 10:30 to yell at her, and then Dumb #22 wouldn’t talk to her when she called him this morning. So then Mom calls me to tell me that my facts are not all correct. The Fish-Man did not actually pay her for Mr. Fish; she gave him away. Just so that I am clear: this is better? Anyway, this was the only point she disputed. She said if my brothers were so upset, they could go to the fish store and buy Mr. Fish themselves. Eh-hemmm. Brace yourselves…. Unimportant addendum: For the next day, all creativity is being funneled elsewhere. Yes, in between gagging and throwing-up, I am finally working. I finished five of the six design specs today, and now just have to finish the drawings and have the photo’s taken. Tomorrow while Jeffrey is at school, Eric and I will go to the printer. The plastic bag in my purse will hopefully not be needed. Seriously, three is a good number, right?